Watch: Kareena Kapoor Khan's Shocking Reaction When Asked About Deepika Padukone's Padmavati! 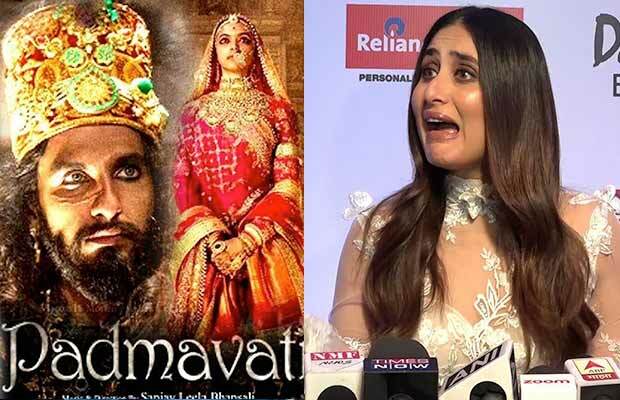 Home BOLLYWOOD Watch: Kareena Kapoor Khan’s Shocking Reaction When Asked About Deepika Padukone’s Padmavati! Kareena Kapoor Khan's Shocking Reaction When Asked About Deepika Padukone’s Padmavati! Kareena Kapoor Khan gave an unbelievable reaction when she was asked to comment on the controversy around Deepika Padukone’s Padmavati! Deepika Padukone‘s Padmavati has faced backlash from several fringe groups across the country. But the team of the film has also gained a lot of support from the film fraternity. Many celebs including Alia Bhatt, Twinkle Khanna, Sonam Kapoor, Arjun Kapoor and many more have extended their support to the film. And the same was expected from the actress Kareena Kapoor Khan. But when the media asked the actress to comment on the controversy around the film, she gave a very shocking reaction. The actress was at the Filmfare Glamour And Style Awards 2017, where she looked stunning in her white outfit. When she came to interact with the media, that’s when they dropped the question about Padmavati. Although Kareena talked about the event and her outfit. But when she was asked about the film, she just ignored it completely asking “Any other question?” Media even prompted her asking if she wants to support Deepika. But the Ki And Ka actress just did not seem to be in the mood to say anything regarding Padmavati. And hence she just walked off. Talking about Kareena Kapoor Khan’s professional front, she is going to be seen in the film Veere Di Wedding, which is currently on floors. The film also stars Sonam Kapoor, Swara Bhaskar, Shikha Talsania and Sumeet Vyas. Veere Di Wedding, is being helmed by Shashank Ghosh and produced by Sonam’s sister Rhea Kapoor. It is slated to release on May 28, the next year.